Piecemeal Plants Nursery in Leicestershire | contact us - a plant nursery providing unusual plants, herbaceous perennials and a selection of annuals. Piecemeal Plants nursery will be open on Easter Sunday and Bank Holiday Monday, 20 and 21 April, from 12 to 5. And regularly on Thursday and Friday afternoons from 1 pm up to mid September. Also on Sundays from 1 to 5 during May and June. Any additional, occasional opening dates and times will be advertised here. 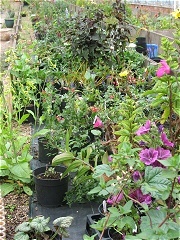 The nursery is also open throughout the year by arrangement. Please make contact by phone, text, email or Facebook - or if you are looking for a particular plant. 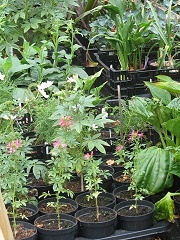 Propagation etc continues on a regular basis throughout the year, and during such times customers are very welcome to browse and/or purchase plants. 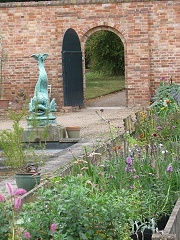 Whatton House Gardens are open daily from 11 to 4 (often later in summer).